When Knighton is under attack by Jestro, LEGO® NEXO KNIGHTS™ knights roll into action! Send out The Fortrex, the huge 2-in-1 rolling castle! Launch the Knight Cycle and Aero-Striker V1 to engage the Ash Attacker and Scurriers! Fold out the walls to reveal the hi-tech HQ and get your brief from Merlok 2.0, and plan your next daring mission at the round table to stop Jestro taking the Book of Evil! Includes 5 scannable shields for NEXO Powers: Ground Pound, Super Human Speed, Hawk Holler, Chicken Power and Charging Attack. Last known price is 24% below the initial Lego retail price! The The Fortrex (70317) Lego set is no longer directly available from the sites below. However, 3rd party partners of these sites might still have the set available. 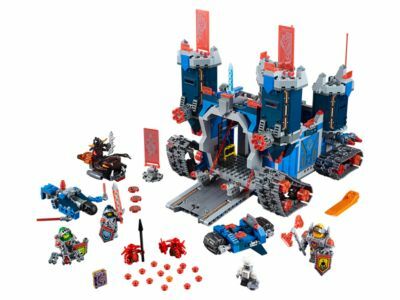 Alternate description Roll out The Fortrex­­, the LEGO® NEXO KNIGHTS™ hi-tech 2-in-1 castle, including crossbow flyer, Firesquito, feature-packed battle station HQ and 7 minifigures. Includes 7 minifigures: Clay Moorington, Aaron Fox, Axl, Chef Eclair, Ash Attacker and 2 Scurriers. The Fortrex features 2 rapid-fire stud shooters on the front; a disc shooter concealed under the drawbridge; 2 stud shooters on the drawbridge and 2 movable double laser cannon stud shooters. Weapons include Clay Moorington's grey sword and Techalibur, Aaron Fox's Blazer Bow stud shooter, Axl's Big Power Axe, Scurriers' spear and dynamite, and Ash Attacker's Magma Blade. Accessory elements include the Book of Evil, Merlok 2.0 character, Techalibur sword, shooting target, robot trainer with movable arms, ladders, toolkit, frying pan, cup, chicken leg, 3 helmets and Chef Eclair's chef hat! Aaron Fox's Aero-Striker V1 flyer features a missile shooter and movable wings. Ash Attacker's Firesquito features a Globlin disc shooter. Lower the drawbridge to launch Clay Moorington's Knight Cycle and pop up Aaron Fox's Aero-Striker V1. Detach the Aero-Striker V1 from The Fortrex. Capture the enemy and secure them in The Fortrex's prison. Castle walls easily open out to reveal the feature-packed LEGO® NEXO KNIGHTS™ headquarters, featuring a round table, training area, prison, kitchen and more. Place Merlok 2.0 in the centre of the round table, and push him down to release 4 chairs, featuring shield holders. Help Chef Eclair prepare a tasty snack for Axl and the hungry knights in the kitchen. Practice swordsmanship skills and improve your aim in the weapon training area. Repair Aaron Fox's Aero-Striker V1 with the toolset and tools. The Fortrex measures over 9” (25cm) high, 8” (21cm) wide and 9” (24cm) deep, and over 9” (25cm) high, 14” (37cm) wide and 9” (23cm) deep with walls folded out. Combine with the attachable 70324 Merlok Library 2.0 for extra reinforcements! Scan shields for each of the 5 NEXO Powers (Ground Pound, Super Human Speed, Hawk Holler, Chicken Power and Charging Attack) and power up in the LEGO® NEXO KNIGHTS™ game!